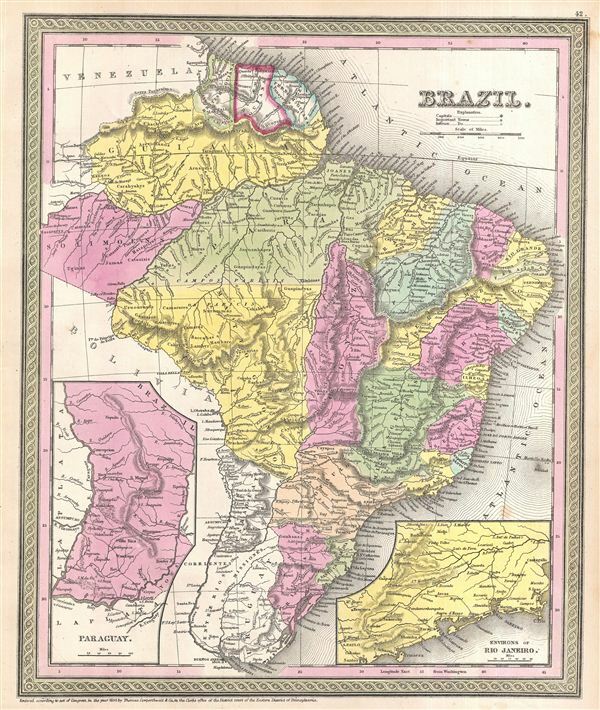 A fine example of Thomas Cowperthwait and S. A. Mitchell's 1854 map of Brazil. Covers all of modern day Brazil from Guiana and Venezuela in the north to Uruguay in the south and from Bolivia in the west to the Atlantic. Depicts Brazil divided into its constituent states with some reference to indigenous groups throughout. Insets in the lower right and left quadrants focus on Paraguay and the environs of Rio de Janeiro, respectively. This map also includes the adjacent French, British, and Dutch Guianas, and parts of Bolivia, Venezuela, Uruguay, and Argentina. The whole is engraved in Mitchell's distinctive style with green border work and vivid pastels. Political and topographical features are noted and color coded with elevation rendered by hachure. Rumsey 0537.041 (1846 edition). Phillips (Atlases) 814.